Grace Norman, shown here running in a 2015 paratriathlon test event in Rio de Janeiro, Brazil, has been testing a new prosthetic running leg while training in Sandy, Utah this summer. 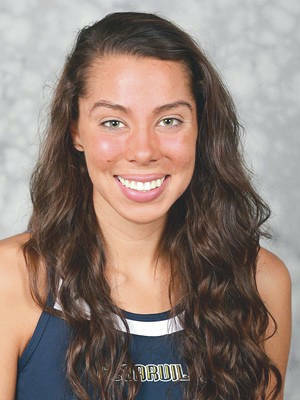 COALVILLE, Utah — Still smarting from a loss to British rival Lauren Steadman in a Sprint Paratriathlon event in Yokohama, Japan, Cedarville University distance runner Grace Norman has been training in Utah with her personal coach Wes Johnson. On May 12, Norman lost to Steadman by more than two seconds at the International Triathlon Union-sanctioned Yokohama World Triathlon Series paratriathlon event in the PTS5 racing division. Steadman competes without a right forearm; Norman is a below-knee amputee due to congenital constriction band syndrome of her left leg at birth. Both talented athletes compete in the same PTS5 division. 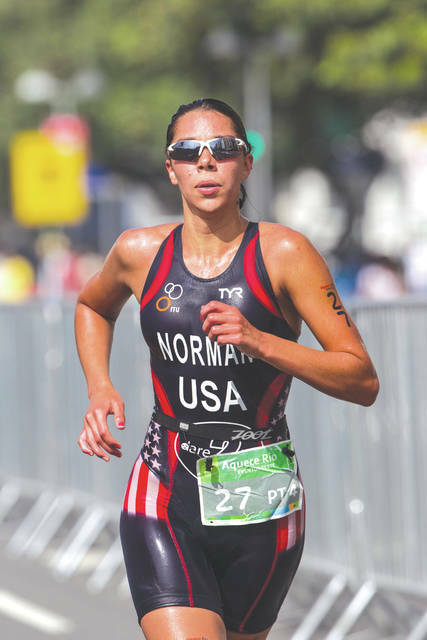 The loss at Yokohama was Norman’s first loss in an ITU event since September 18, 2015 at an ITU event in Chicago, where she also finished second. In an effort to make up some time to Steadman, Norman has been in Sandy, Utah training with the BAM (Balance Art Multisport) running team. While there, a designer with Optimus Prosthetics worked with Norman to design/re-align a running/biking foot that would enable her to get more power out of each pedal stroke on her racing bike. According to Norman’s mother, Robin, the new Cheetah foot that Optimus’s Glenn Schober is working on is a second generation prosthetic running blade and a second-generation bicycling leg. On July 14, and wearing her new second-generation prosthesis, Norman competed against a field of 194 able-bodied triathletes at the Echo Canyon Triathlon in Coalville, Utah. Competing in the Sprint Triathlon, Norman placed first overall among the women competitors in a time of 1:14.29. She was 11th overall when listed among the men in the field. According to the ITU Paratriathlon Rankings as of July 16, Norman remains ranked no. 1 in the world among women competitors in the PTS5 division with Gwladys Lemoussu of France listed as no. 2 and Great Britain’s Steadman third. It was not known whether the July 16 rankings reflected the Yokohama result. Norman plans on competing in the upcoming ITU event July 27-29 in Edmonton, Alberta, Canada. Steadman and Lemoussu are not entered in Edmonton, but will instead be competing in a European Triathlon Union-sponsored event July 19 in Tartu, Estonia. Robin Norman says plans to fit Grace with a direct-connect biking foot have been put off until after the ITU World Championships, Sept. 12-16 in Queensland, Australia. She said Grace plans on competing in an ITU test run event on the planned Tokyo triathlon course in August. That event will also serve as a qualifying event for the 2020 Paralympic Games. Contact John Bombatch at 937-372-4444, Ext. 2123. You can find information about Grace Norman and the ITU paratriathlon series at triathlon.org/paratriathlon .